MBU’s facilities are first-rate and include a brand-new fitness and athletic center, the largest campus coffeehouse in the state of Missouri, and modern living options. From student-led clubs to varsity and intramural sports, kickball tournaments, weekend road trips, campus ministries, and all that St. Louis has to offer, students have countless ways to connect and take part in a vibrant campus life. 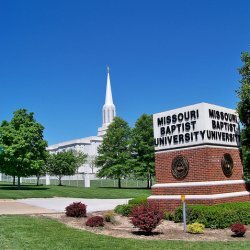 Want to hear more about Missouri Baptist University? Click here to browse academic programs at Missouri Baptist University. *Freshmen students applying to Missouri Baptist have the opportunity to submit an official letter from headmaster or principal including name, graduation date, total number of students in graduation class and class rank (showing evidence of graduating in top 50%) in place of SAT/ACT. The original document must be sent inn the mail. Scans will not be considered. **Students do not have to submit both ACT and SAT scores.